In 1944 Charles Lindbergh took part in over 50 combat missions in the South Pacific. He participated in numerous bombing and strafing attacks and shot down one Japanese aircraft. The question arises: how was Lindbergh, a private citizen, able to strap himself into the cockpit of a fighter aircraft and take part in combat missions? The search for an answer to this question starts 17 years earlier. Charles Lindbergh had captured the hearts of the American people in 1927 by becoming the first to fly solo across the Atlantic (see Lindbergh Flies the Atlantic, 1927). His new-found fame was a double-edged sword that gave him access to the halls of American power while simultaneously engulfing him in a notoriety that would lead to heartbreak and self-imposed exile. On the night of March 21, 1932 the Lindbergh's 20-month-old son was kidnapped from their isolated New Jersey home. The child's body was discovered in a nearby wooded area two months later. This tragedy and the subsequent trial of the only suspect apprehended in the case only increased the press's interest in the "Lone Eagle." Teams of reporters and photographers hounded his every move. To escape this incessant pressure, the Lindbergh's fled America and sailed for England in December 1935. Lindbergh returned to the United States in the spring of 1939 as war clouds began to envelop Europe. He had visited Nazi Germany and was convinced that America should stay out of any impending conflict because it was no match for Germany's military might. Lindbergh became a spokesman for the America First Committee that advocated US neutrality in the event of a war in Europe. His position had political consequences. President Roosevelt publicly attacked America's former hero and in response, Lindbergh resigned as a colonel in the Air Corps Reserve. After the Japanese attack on Pearl Harbor in December 1941 Lindbergh offered to reactivate his Colonel's commission but the Roosevelt administration refused. Rebuffed, Lindbergh turned to the private sector but only Henry Ford would offer Lindbergh an advisory position to help in the transition of Ford Motor Company's production lines to outputting bombers rather than cars. By 1944 Lindbergh had became a consultant with the United Aircraft Company helping them with field testing of their F4U Corsair fighter. The spring of 1944 found Lindbergh in the South Pacific teaching Corsair pilots how to dramatically decrease their plane's fuel consumption and increase the range of their missions. His task required that he join the Corsair pilots on their missions in order to better understand and change their flying techniques. This is how Lindbergh, a private citizen, managed to make his way into the cockpit of a combat fighter, take part in over 50 missions and shoot down one Japanese plane. "My tracers and my 20's spatter on his plane." We jettison our drop tanks, switch on our guns, and nose down to the attack. One Jap plane banks sharply toward the airstrip and the protection of the antiaircraft guns. The second heads off into the haze and clouds. Colonel MacDonald gets a full deflection shot on the first, starts him smoking, and forces him to reverse his bank. We are spaced 1,000 feet apart. Captain [Danforth] Miller gets in a short deflection burst with no noticeable effect. I start firing as the plane is completing its turn in my direction. I see the tracers and the 20's [20mm. cannon] find their mark, a hail of shells directly on the target. But he straightens out and flies directly toward me. I hold the trigger down and my sight on his engine as we approach head on. My tracers and my 20's spatter on his plane. We are close - too close - hurtling at each other at more than 500 miles an hour. I pull back on the controls. His plane zooms suddenly upward with extraordinary sharpness. I pull back with all the strength I have. Will we hit? His plane, before a slender toy in my sight, looms huge in size. A second passes - two three - I can see the finning on his engine cylinders. There is a rough jolt of air as he shoots past behind me. By how much did we miss? Ten feet? Probably less than that. There is no time to consider or feel afraid. I am climbing steeply. I bank to the left. No, that will take me into the ack-ack fire above Amahai strip. I reverse to the right. It all has taken seconds. My eyes sweep the sky for aircraft. Those are only P-38's and the plane I have just shot down. He is starting down in a wing over - out of control. The nose goes down. The plane turns slightly as it picks up speed-down-down-down toward the sea. A fountain of spray-white foam on the water-waves circling outward as from a stone tossed in a pool-the waves merge into those of the sea-the foam disappears - the surface is as it was before. My wingman is with me, but I have broken from my flight. There are six P-38's circling the area where the enemy plane went down. But all six planes turn out to be from another squadron. I call 'Possum 1,' and get a reply which I think says they are above the cloud layer. It is thin, and I climb up through on instruments. But there are no planes in sight, and I have lost my wingman. I dive back down but all planes below have disappeared, too. Radio reception is so poor that I can get no further contact. I climb back into the clouds and take up course for home, cutting through the tops and keeping a sharp lookout for enemy planes above. Finally make radio contact with 'Possum' flight and tell them I will join them over our original rendezvous point (the Pisang Islands). The heavies are bombing as I sight the Boela strips; I turn in that direction to get a better view. They have started a large fire in the oil-well area of Boela - a great column of black smoke rising higher and higher in the air. The bombers are out of range, so the ack-ack concentrates on me-black puffs of smoke all around, but none nearby. I weave out of range and take up course for the Pisang Islands again. I arrive about five minutes ahead of my flight. We join and take up course for Biak Island. Landed at Mokmer strip at 1555. 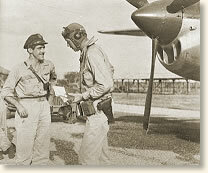 (Lieutenant Miller, my wingman, reported seeing the tracers of the Jap plane shooting at me. I was so concentrated on my own firing that I did not see the flashes of his guns. Miller said the plane rolled over out of control right after he passed me. Apparently my bullets had either severed the controls or killed the pilot.)" Lindbergh's account appears in: Lindbergh, Charles, A., The Wartime Journals of Charles A. Lindbergh (1970); Berg, A. Scott, Lindbergh (1998). "Charles Lindbergh in Combat, 1944," EyeWitness to History, www.eyewitnesstohistory.com (2006). Hear Charles Lindbergh speak at an anti-war rally in Des Moines, Iowa September 1, 1941.